What an amazing but challenging race!!!!! 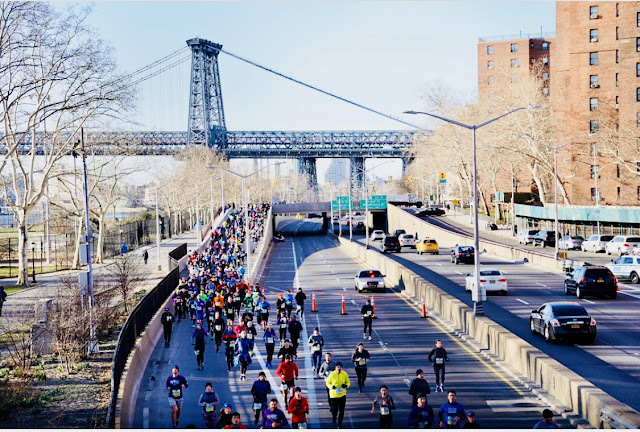 The new course was amazing from crossing the Manhattan bridge, to running through many iconic places in the city, including Times Square and Grand Central Terminal, and on those HILLS inside Central Park. First, can I just mention that I got absolutely no sleep the night before? There was a mysterious power outage in my area. My daughter was up most times because she was scared of the dark and I had to cater to her. On top of that, I was anxious about the race. Since I did not sleep at all, I was up(moving about and getting ready; stretching/massage) at 4am. I was placed in wave 1, which meant an early start at 7:30am. Since I was taking public transportation, I had to leave my house by 5:30am two hours before. I am always anxious about arriving late so I give myself plenty of time ahead. When I got to the train station, I was overwhelmed by the number of runners I saw. I had never seen so many runners traveling to the race start location. This picture does not show how crowded the train was. The train was packed to the point that there was absolutely no room between bodies. To make matters worse, the crowd increased at every stop. The trip to the start location was about 45 minutes and the whole time I was standing and could hardly breath. The little energy I had was slowly diminishing. I knew it was just a matter of time before I started to feel nauseous. Thankfully, I had my Peppermint essential oil on me.. 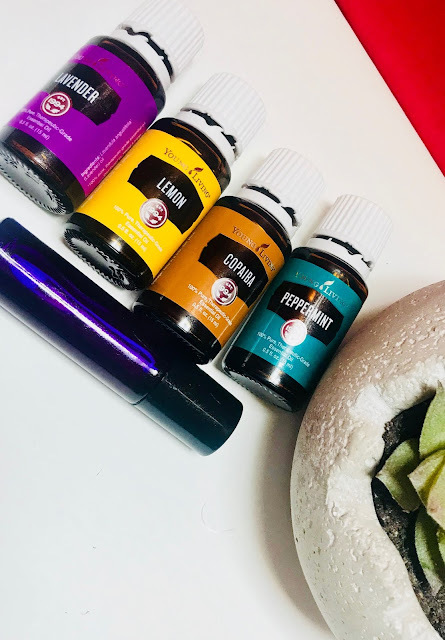 I opened up the bottle and sniffed the oil for therapeutic benefits, which includes an energy boost and nausea reduction. That helped a great deal as I kept the bottle opened under my nose till I got off the train. 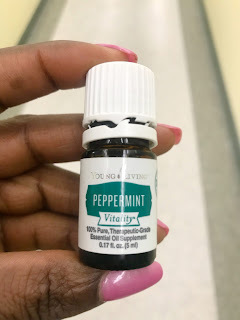 Let me just mention that Peppermint essential oil is a holy grail in my fitness routine. It goes in my water, that I drink, and is massaged into my muscles, before any fitness activity. On race day, I smelled like a farm of peppermint. You would be energized if you were around me...FACTS!!!! When I got off the train, I could not believe how large the crowd was. There was police EVERYWHERE. We had to go through bag check points for obvious reasons. It was starting to feel real now and my excitement was increasing BUT it was cold and windy and I had to make one more stop to the restroom, before I settled into starting. That was another 30 minute wait. Thankfully, the restrooms were in our corals, so you just used the bathroom and took position. I kept sniffing my Peppermint to keep me energized and alert, especially since I did not sleep the night before. I had about five minutes to stretch before the gun went off. At the corals, were placed potties for convenience. 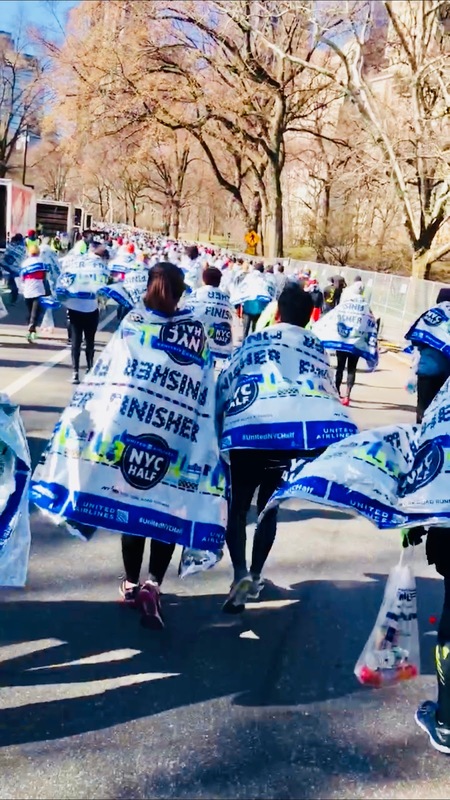 Thanks NYRR!!! Once I started running, I pushed myself to run strong. There was no way I was allowing myself to run slow, just because I did not sleep the night before. 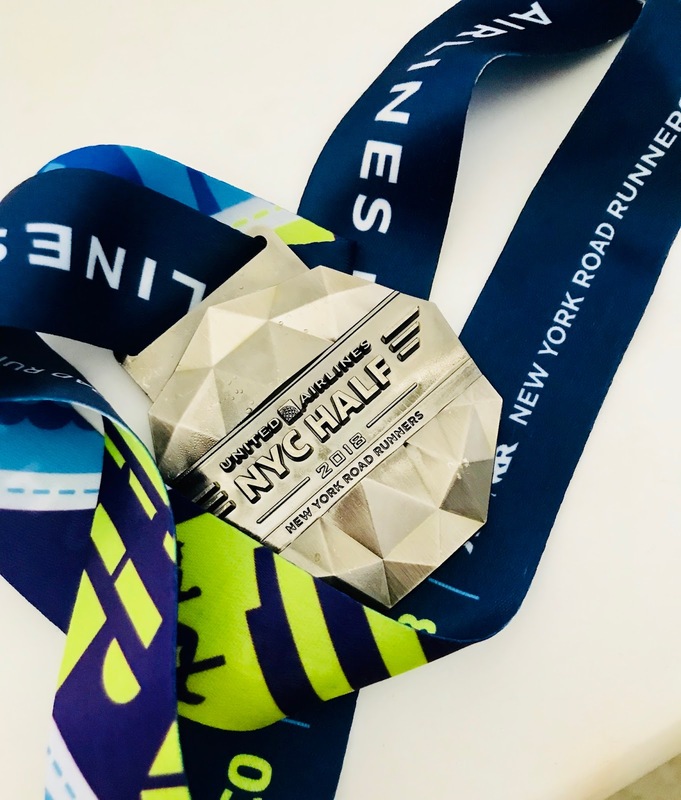 I had trained hard for this, and in my head, I was thinking, most of my training was done, after getting off an overnight shift, so I could push even harder. 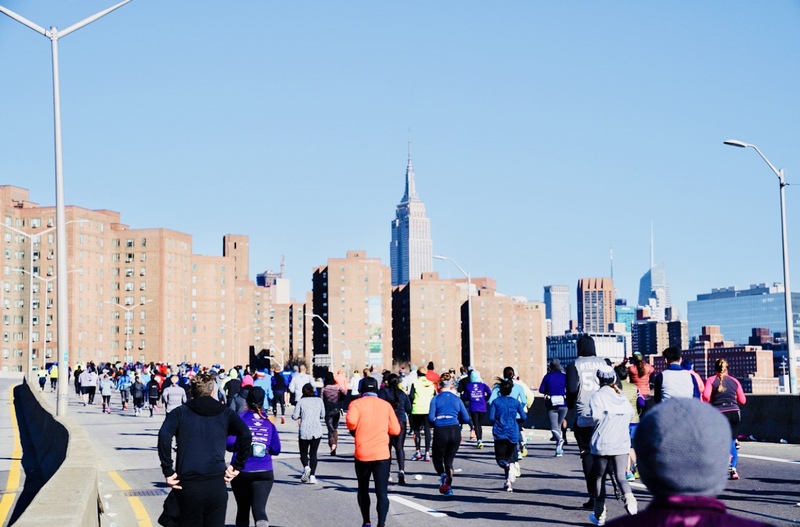 The first mile seemed flat on Flatbush and Atlantic Avenue in Brooklyn, however, with lots of potholes on the ground though. I have a history of falling while running, so now, I always look down when running to avoid falling again. My average was 8 minute per mile on the first mile. I knew then that I had to slow down. I had started too fast. I was able to slow down but not for long, before I picked up the pace again. I really wanted a good time for this race ( 1hr 45/47 minutes). 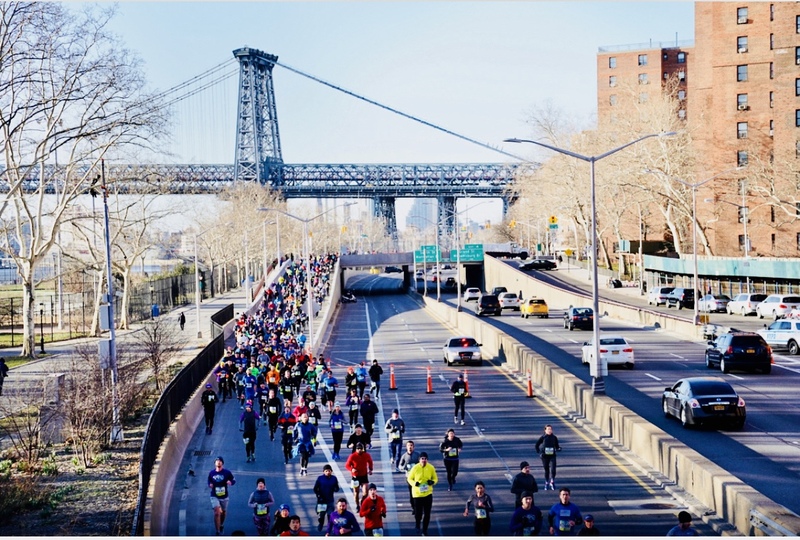 As we approached the Manhattan bridge, the excitement was crazy. I could feel other runners' too as well. It was tiring but the training got me ready for moments like those. The view was amazing! I had never run on any major bridge, so that was amazing. Then came China Town, and as we turned a corner, there was a crowd waiting to cheer us. 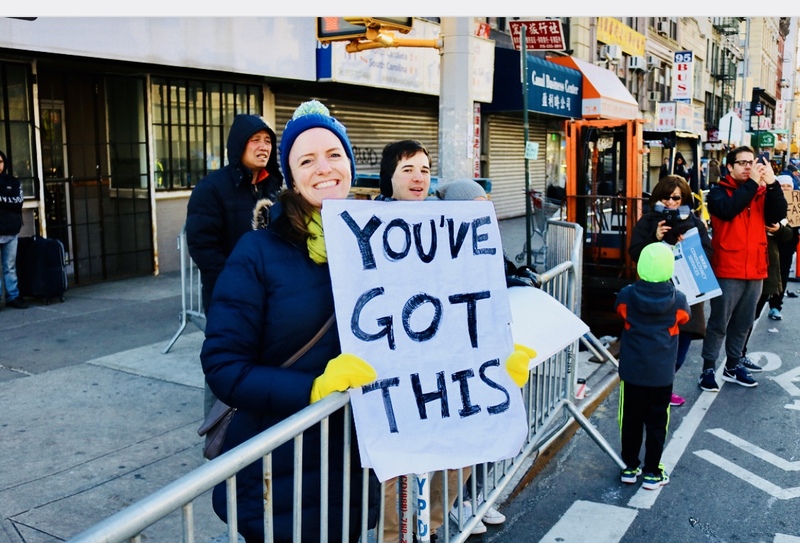 People in NYC are amazing for coming out on such a cold day to cheer runners. There was a different kind of energy I drew from the crowd, that made me feel like I was flying. I cannot even describe the feeling. Running on FDR and through Grand Central was simply amazing. The crowd continued to be amazing. Now, I must mention that I was tired and there were times I slowed down to reboot and when I did, I ran too fast. My pace was just all over the place as shown in the screenshot below. Take a look at mile 10, when I was almost at the end of the race, and tired, but ran the fastest at 7.04 per mile. You will see why I did not have negative splits at the end of the post. 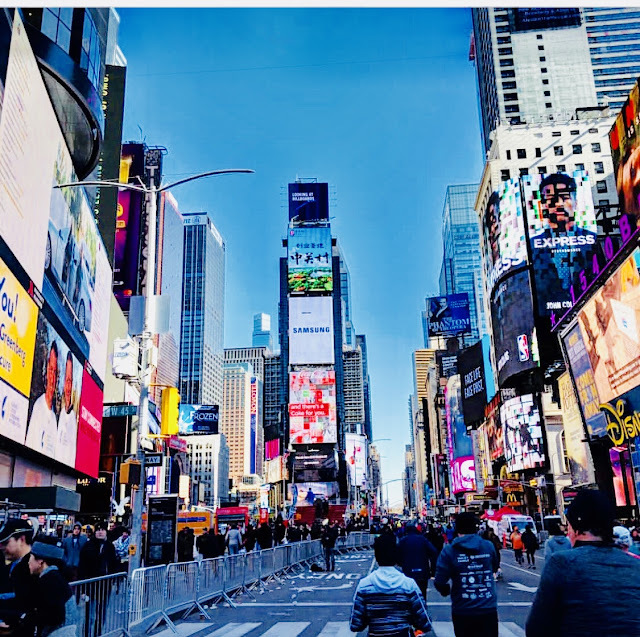 Now, I knew we were approaching Times Square, after leaving Grand Central, so I slowed down a bit to take in all the excitement. Running through Times Square is one of my favorite parts of the race. This was at mile 8, so you can see I really slowed down, as shown in the screenshot above. It was nice seeing the kids at the Rising New York Road Runners (This is a youth race that takes place alongside the United NYC Half Marathon, in Times Square). Then came Central Park at mile 9, and my heart began to beat so fast, because, there are these hills inside the park that torture me every single time I race. The ones I had to deal with on this race were the Cat and Sister hills. I had gone to the race expo and learned that we would have to tackle those hills, towards the end of the race, so I knew what was coming. 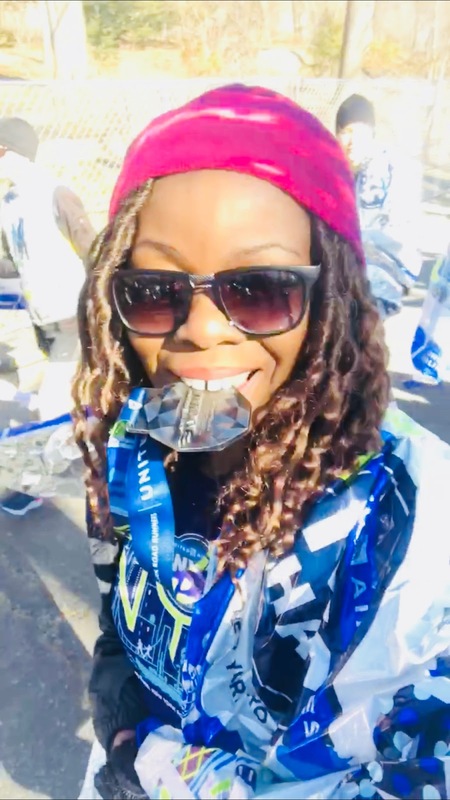 I was so hyped about not wanting to run slow, so I gathered all the energy I could find within myself to run mile 10 and hoped I could keep that going. That was a wrong move, because I ran a minute and 26 seconds slower on the 11th mile. I picked it up again on the 12th mile by 33 seconds. Although I fought HARD on the hills, they still slowed me down . The cat hill alone is a 1/4 mile stretch, which occurs around a curve, and makes it hard to build and sustain momentum. The last 1/2 mile was downhill but by this time, my legs were done. In fact, I ran the slowest during the last mile, which may "make sense' to non-runners, because naturally, you are tired at the end. However, getting negative splits (the further the faster) is every runner's goal. I am very satisfied with the results, knowing that I fought hard to sustain momentum, especially during the last 5k. Overall, I will say that it was a great race and it was my 9th Half Marathon!!! The new course was more challenging will lots of uphill running. I have to train more frequently running exclusively uphill. Oh, and we had had to walk about 1/2 mile to get out of the park, as if running 13.1 miles, mostly uphill was not enough. Check out that medal though!. "It doesn't matter whether you come in first, in the middle of the pack, or last. You can say, 'I have finished.' There is a lot of satisfaction in that."